Make the movies of the mermaid into whom it was put in the aquarium, and it is projected on the fog stretched in the fish tank. The motif is Mermaid, the existence which is being in the interval of a human and not human. 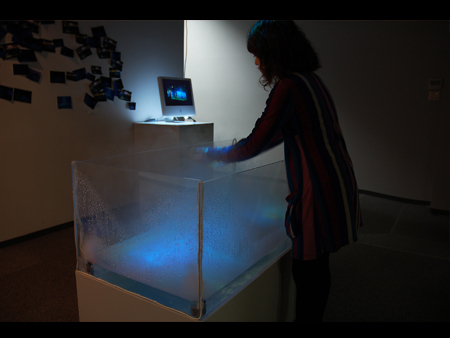 Compare it to "Hazama(interval)"
Fog has accumulated in the bottom of the tank deeply, when people are not in the exhibition room. 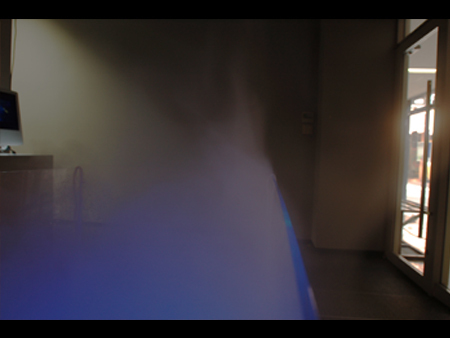 When people approach, let some fresh air into the room, they fan or breath it, fog becomes thin and the movie reflected in the bottom of the tank appears. 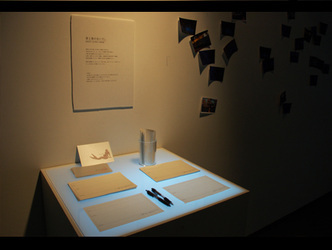 Put a computer monitor also and it show the same movie as the movie projected on the tank.Since the image in fog is not visible clearly, it is the supplementary role. Moreover, the same image is printed a photograph, and is stuck on a wall, and the appreciation person enabled it to bring home freely. The movies are nine kinds and about 15 minutes. 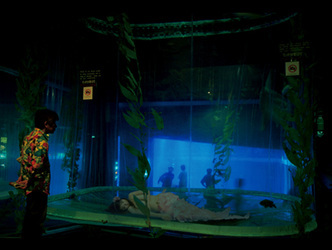 We made the scenery that the mermaid is a show in the aquarium. What there is a mermaid there is most proper in the movies. 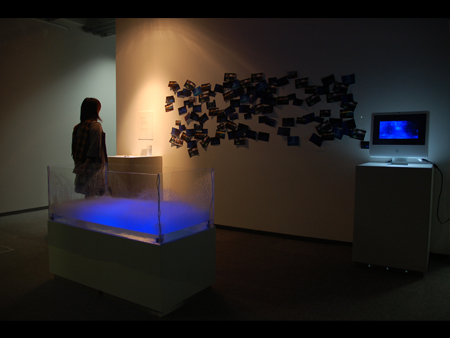 Although there is no music in the exhibition room, the ultrasonic fog machines always circulate water and make a sound. "Hazama(interval)"is it exists in the boundary of a certain things and a certain thing. This work is attention to the world of such an interval, and use the mermaid who lives in the interval of a human and not human. Also, fog is a symbol of the misty world on the boundary. we want to make a new appreciation of existence of the "Hazama(interval)" which is not conscious of have usually. By being conscious of a boundary, you should feel the unclear of thinking "it is most proper" and the beauty in the fluctuation.